Users can configure Software RAID during the graphical installation process (Disk Druid), the text-based installation process, or during a kickstart installation.This chapter covers Software RAID configuration during the installation process using the Disk Druid application. Apply software RAID partitions to the physical hard drives. To add a boot partition (/boot/) to a RAID partition, ensure it is on a RAID1 partiton. Optional: Configuring LVM from the RAID devices. Although this procedure covers installating with a GUI application, system administrators can do the same with text-based installation. These examples use two 9.1 GB SCSI drives (/dev/sda and /dev/sdb) to illustrate the creation of simple RAID1 configurations. They detail how to create a simple RAID 1 configuration by implementing multiple RAID devices. In a typical situation, the disk drives are new or are formatted. Both drives are shown as raw devices with no partition configuration in Figure 4.1, “Two Blank Drives, Ready For Configuration". 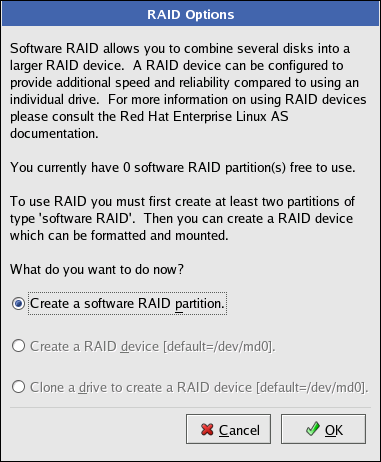 Choose Create a software RAID partition to create a RAID partition as shown in Figure 4.2, “RAID Partition Options". 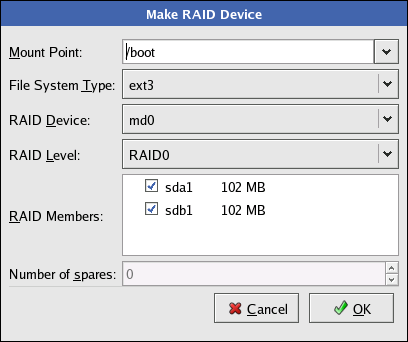 Note that no other RAID options (such as entering a mount point) are available until RAID partitions, as well as RAID devices, are created. Repeat these steps to create as many partitions as you need for your partitions. 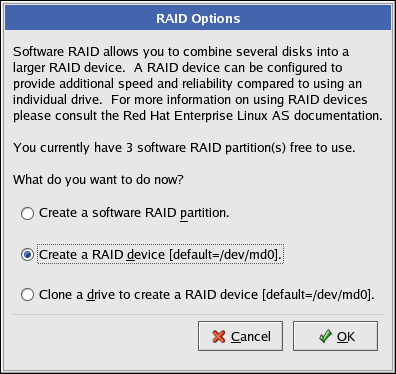 Select the RAID button on the Disk Druid main partitioning screen (refer to Figure 4.5, “RAID Options"). 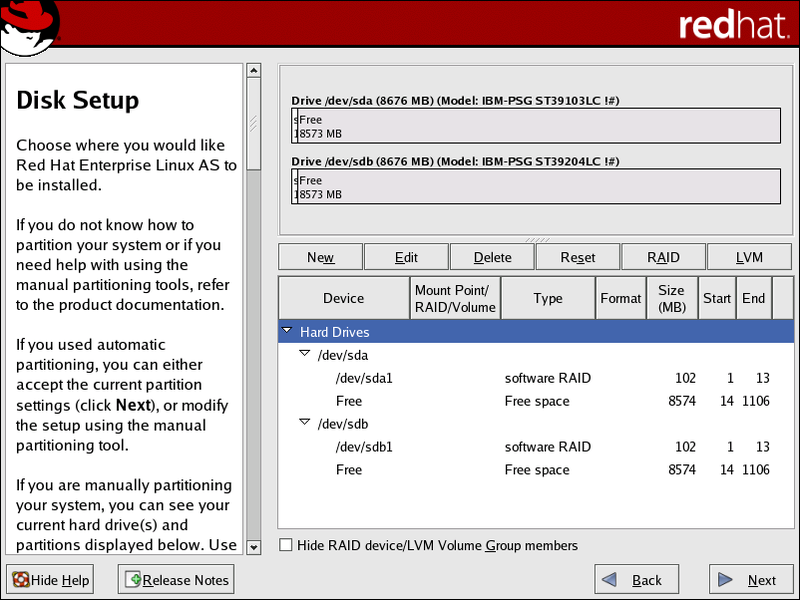 Figure 4.5, “RAID Options" appears. Select Create a RAID device. Next, Figure 4.6, “Making a RAID Device and Assigning a Mount Point" appears, where you can make a RAID device and assign a mount point. Choose the file system type for the partition. At this point you can either configure a dynamic LVM file system or a traditional static ext2/ext3 file system. For more information on configuring LVM on a RAID device, select physical volume (LVM). If LVM is not required, continue on with the following instructions. If you are making a RAID partition of /boot/, you must choose RAID level 1, and it must use one of the first two drives (IDE first, SCSI second). If you are not creating a seperate RAID partition of /boot/, and you are making a RAID partition for the root file system (/), it must be RAID level 1 and must use one of the first two drives (IDE first, SCSI second). If configuring RAID 1 or RAID 5, specify the number of spare partitions. If a software RAID partition fails, the spare is automatically used as a replacement. For each spare you want to specify, you must create an additional software RAID partition (in addition to the partitions for the RAID device). 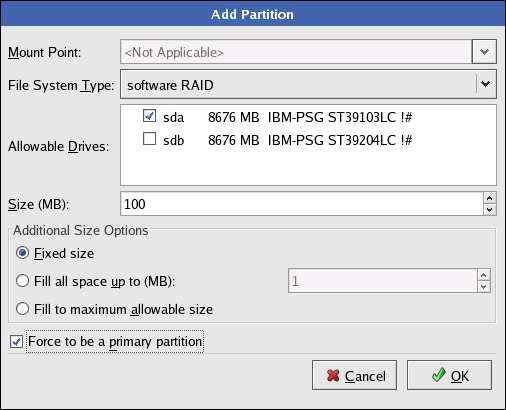 Select the partitions for the RAID device and the partition(s) for the spare(s). After clicking OK, the RAID device appears in the Drive Summary list. Repeat this chapter's entire process for configuring additional partitions, devices, and mount points, such as the root partition (/), /home/, or swap. 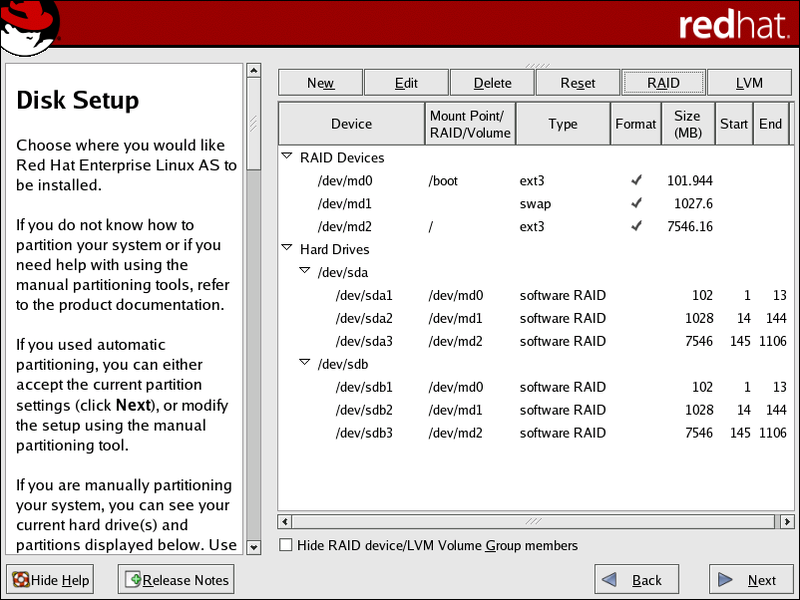 After completing the entire configuration, the figure as shown in Figure 4.8, “Final Sample RAID Configuration" resembles the default configuration, except for the use of RAID. 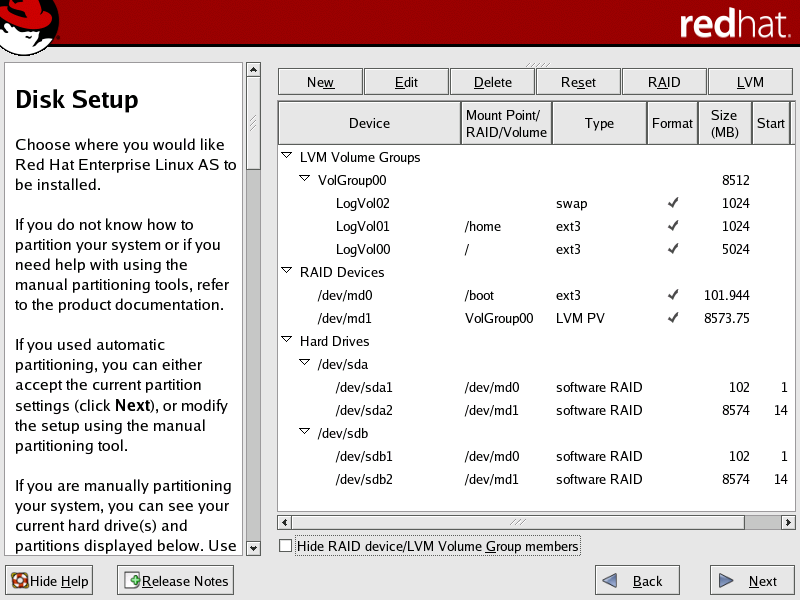 The figure as shown in Figure 4.9, “Final Sample RAID With LVM Configuration" is an example of a RAID and LVM configuration. You can continue with your installation process. 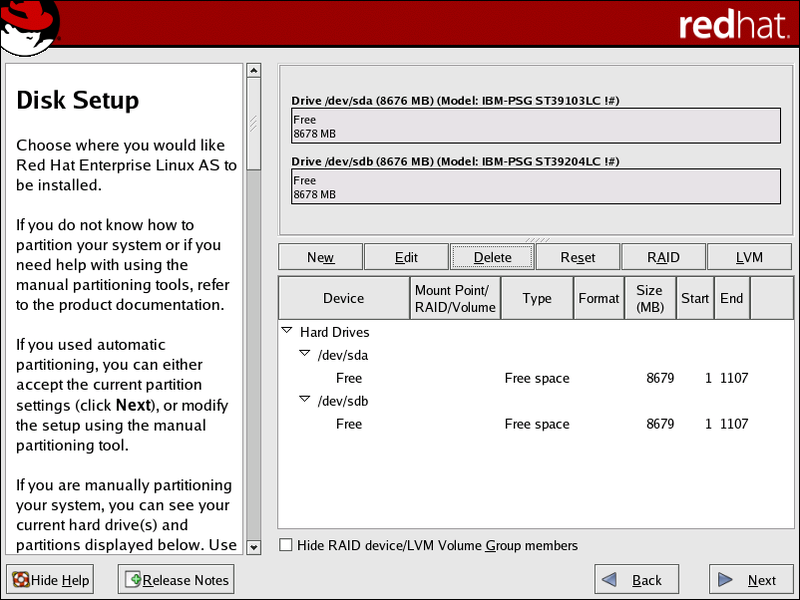 Refer to the Red Hat Enterprise Linux Installation Guide for further instructions.